The rose American Pillar was first bred in 1902 in the United States by Dr Walter Van Fleet and it was later introduced to market in 1908 by Conard & Jones. Dr Walter Van Fleet worked as a breeder from 1905 into the 1920's, for the Dept of Agriculture Plant Introduction Station that was based in Glenn Dale, MD. This government agency was tasked with creating and developing plants that would be able to survive in the North American Climate. 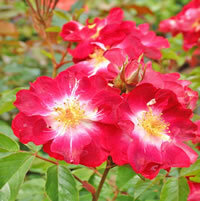 American Pillar roses are far more hardy than many types of roses and can thrive in zones 4 through 9. 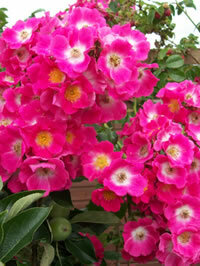 This rose produces bright pink blooms averaging 2.25" in diameter with white centers. These blooms form with only 5 petals each and have no fragrance. The rose American Pillar grows quite large and can reach heights of up to 23' tall or so. This rose also spreads out and can reach widths of 10 feet across. American Pillar is somewhat tolerant of shady locations however is it also susceptible to mildew. Growing the rose American Pillar is much like any other type of rose and this variety lends itself well to a wide range of landscaping ideas. Given the heights to which this rose can reach, you should try to find a spot for it where it can't quickly overgrow nearby plants. This rambler has a unique tolerance for shady locations, and I have often seen pictures where growers plant it under trees and allow it to use that for support. Like most shade tolerant roses however, even this variety will still do its best work if you can provide it with full sun for at least part of the day. Roses are by nature sun loving plants and they will almost always produce far more blooms if given direct sun light, compared to growing them in shady spots. You should shoot for a minimum of 6 to 8 hours a day of sun. American Pillar roses also have a susceptibility to mildew, so making sure they are planted in soil that drains well is extremely important. Try to choose a spot that also has good air circulation through your garden. This will go a long way towards helping to keep the leaves of your rose American Pillar dry, and keep the plant that much healthier. Planting your rose American Pillar is not difficult and in spite of what many new gardeners think, just about anyone can get the job done. The first thing I suggest to people is to take a trip to the local garden center and pick up a bag of organic compost. This stuff is usually inexpensive and it really helps roses establish in a new location quickly. When you dig your hole, toss the soil into a wheel barrow and mix it with the compost at a ratio of 1 part compost for every 2 parts soil. How you plant your American Pillar roses does depend a little on the manner in which you purchased them. If you found one at a local nursery then it was probably already planted in a container and ready to bloom. 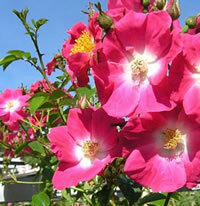 These are the easiest types of roses to plant because they are already established. Dig yourself a hole that is at least twice the diameter of the container it came in, and equally as deep. This gives you ample room for your new soil mix around the roots, but still keeps the bud union at the same depth it was in the container. If you went online to order your rose American Pillar, then it was probably shipped to you as a bareroot plant. Many gardeners find these intimidating, but there is no reason to. The first thing you should do is soak the plant overnight in a bucket of lukewarm water to re-hydrate the roots prior to planting day. Then dig yourself a hole that is as wide as the longest roots on the plant, and make sure it is deep enough so that you can set the plant atop a mound of soil in the center, and keep the bud union about an inch or two below the surface. Once you set your rose American Pillar in place, spread the roots out in all directions around the mound and then back fill the hole halfway with your new soil mix. Water the loose soil heavily so that it flows around the roots like mud, then back fill the hole the rest of the way. This should ensure that no air pockets have formed. You should then mound up some mulch around most of the exposed canes until new growth starts forming, then remove the mound back down to ground level. This will keep the canes from drying out. Taking care of the rose American Pillar is pretty easy and straight forward. 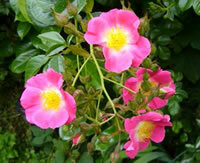 You should make sure that your roses are getting sufficient water but also making sure that you are not over-doing it. A good rule of thumb is one deep watering each week. If you are unsure if it is time to water, stick your finger into the soil at the base of the plant. If it comes out wet, you do not need to water. 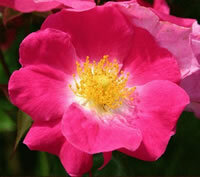 American Pillar roses will benefit from a dose of fertilizer in the early spring when the leaves start to form. I have learned from past experience to stay away from liquid chemical fertilizers for my roses, as these can too easily burn some varieties if not applied precisely. Look for a good, all-purpose granular fertilizer. Since the rose American Pillar only blooms once per growing season, there is not much benefit to giving it additional feedings throughout the year. There is not much pruning required for the rose American Pillar and like most other types of climbing roses, you can let it grow to the desired shape and height of your choosing. You should do some basic maintenance to the plant however to get the maximum amount of blooms. In the early spring before the leaves form, remove any dead wood, along with canes that look overly discolored from disease. Then go through and prune back any canes that overlap one another as these will eventually compete for sun light once the leaves fully open. Lastly, you can go through and prune back the remaining canes for shape and height, tying them off to whatever support you are using. Once you are done pruning your American Pillar roses, make sure to rake up around the base of the plant and throw away all the debris and cuttings in the trash. Never toss them into the compost pile. Finish up by giving your rose American Pillar a fresh layer of mulch to start off the new growing season.